Trillium ovatum. Western Trillium or Wake-robin. While other vegetation is still winter-bare, this elegant blossom unfurls in its whorl of large sessile leaves to punctuate moist shay woods from British Columbia south to Central California, from lowlands to well up in the mountains. Indeed, one of its common names, Wake-robin, implies that it precedes the earliest of birds. The Latin generic name Trillium, meaning triple, is appropriate to describe the parts of three in petals, sepals, and leaves – all supported by a sturdy bare stem as much as 12 inches tall. This species is distinguished from another common woodlawn trillium in having a thin stem or pedicel that bears each solitary flower above its three broad net-veined leaves. The fragrant white flowers of T. ovatum turn purplish with age. The botanical history of this plant is tied to the history of the pacific Northwest via Lewis and Clark Expedition. On their return trip east in 1806, Captain Meriwether Lewis collected it "on the rapids of Columbia river", one of the 150 novel specimens he conveyed to botanist Fredrick Pursh. 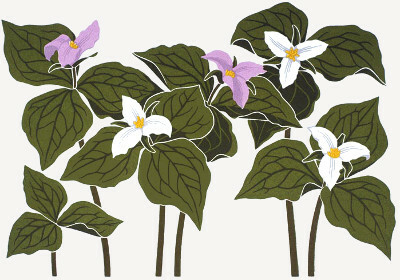 It was from the Lewis collection that Trillium ovatum was first described and named by Pursh in his Flora Americae Septenrionalis of 1814, the first account of North American plants to include the Pacific Northwest. The familiar admonition not to pick trilliums is well founded. Removing the flower stem robs the rhizome of the food supply necessary to produce next year's plant, and some years may be required for recovery. Trilliums do not transplant well, but may grow from seed with patience. As many as seven years may pass before a white blossom is produced to crown the three stem-leaves. Ants are a natural aid in dispersal, attracted by sweet tissue on the seeds.